Leave your peripherals at the door. Hippies, pirates and natives, oh my! 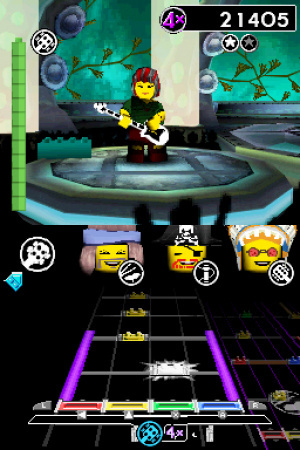 Harmonix and Telltale Games have unearthed details about their upcoming DS version of LEGO Rock Band, and it looks like it's familiar territory for music game fans. Developed by Backbone Entertainment, the DS version will play closer to Harmonix's recent PSP Rock Band, which was heavily influenced by their earlier music games Frequency and Amplitude, than to Neversoft's Guitar Hero: On Tour games. In those titles, you use the face buttons (and optionally the touchscreen in this DS version) to hit notes on four different selectable highways that correspond to an instrument. Highways in those titles were broken up into phrases that, once completed, would play themselves for a while and allow you to jump onto another highway to continue the RAWK. No peripherals are required, making the game compatible with all DS systems. The series' Tour mode is intact, complete with instrument customization and sweaty van rides. Four band mates can team up in the local WiFi mode too, so you can have dramatic band meetings and fire your drummer if you so please. Apart from everything having a brick makeover, the LEGO-ness seeps into the custom character creator, allowing you to draw on some of the toy line's more established lines, making it the first music game to allow you to have a full band of pirates playing The Final Countdown. Locales are also allowed to be a bit more outlandish than traditional Rock Band venues, promising "fantasy locations on Earth… and beyond!" LEGO Rock Band DS is scheduled to hit North American shelves in the holiday 2009 range, along with all of its other versions. Sounds like it coud be good I guess. Wifi AND customization. I've never owned a Rockband game (though I've played them), but I'll likely pick this one up. Amplitude and Frequency are some of the best music games around. I'll definitely check this out at some point. Ghostbusters, Kung-Fu Fighting and Final Countdown. Best. Setlist. Ever. Sounds cool, but it doesn't sound as particularly interesting or innovative as Guitar Hero On Tour. @Gabe Local Wi-Fi, if I read correctly. Oh, I'd forgotten this was coming to DS. And I was about to download Guitar Rock Tour on DSiWare! Phew! Sorry everyone But i laughed at this title not my cup of tea but i'll stick with Guitar Hero Games sorry But LEGO & Rockband Together sounds weird to me :/ but of course thats my opinion. ...And if it was made by iNiS! Too much to ask??? I have to agree with Tails86. Lego Guitar Hero is one of most hilarious games I have ever heard. I am excited about Ghostbusters and The Final Countdown! Wow. I know some of those songs in the list, unlike over Guitar Hero/Rock Band games. It has fricking Ghostbusters theme in it! There is no such thing as local wifi, last time I checked. I thought wifi was online, and wireless pllay was local. Im confused. Chuck Norris should solve my confusion by round house kicking it. Local Wi-Fi = Wireless Download Play. But can you use peripherals.